Blog | Mr. Greek – Because life has to be enjoyed! - Select Location - Floga Toronto Newmarket North York - Dufferin & Finch Richmond Hill - Yonge & Elgin Mills - NOW OPEN Woodbridge - Highway 7 & Weston Rd. Etobicoke - Highway 27 & Finch Toronto (Downtown) - Bremner Barrie - Park Place Mall Richmond Hill - Bathurst St & Rutherford Rd Pickering - Kingston Rd. & Liverpool Rd North York - Yonge & Sheppard North York - York Mills Scarborough - Markham & Steeles Scarborough - Morningside Mississauga - Argentia Mississauga - Dixie Rd. Vaughan - Rutherford & 400 Brampton - Bovaird & 410 Brampton - Queen St. E. Aurora Canadian National Exhibition (Seasonal) Regina - 5885 Rochdale Regina - University Park Dr.
Culinary Celebration In Saskatchewan NEW LOCATIONS OPENING SOON IN REGINA! Toronto, Canada – May 6th, 2016 - Ontario-based Greek restaurant franchise signs their first deal in Saskatchewan with excited Regina entrepreneurs Angela Mamais, Yanni Mamais, Julie Dimas and Chris Dimas. 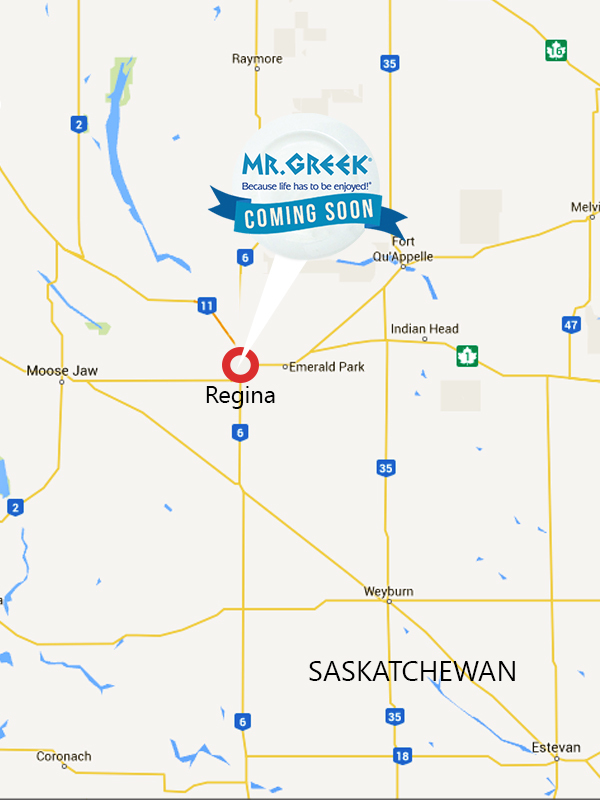 The agreement will ensure the opening of Saskatchewan’s first Mr.Greek location within 6 months, and a second one following before the end of the year. MR. GREEK OPENS SECOND BRANCH IN KUWAIT AT THE GATE MALL Thimar International Food Company announced the Grand Opening of the second local branch of Canada’s number one Greek Restaurant “Mr Greek” at The Gate Mall in Egaila. This opening comes as a continuation of Thimar’s local expansion of the Greek Restaurants chain, to reach for the largest population of Greek food lovers in Kuwait. MR. GREEK Opens It’s First Location in Kuwait! TORONTO, ON – January 23, 2014 – MR. GREEK Restaurants officially opened its first location in Kuwait on January 15, marking the company’s first of five locations planned in the region. “Together with our partners Thimar International Food Company we are thrilled to celebrate the opening of our first MR. GREEK Restaurant in Kuwait.” Says George Raios, President & CEO, MR. GREEK Restaurants.